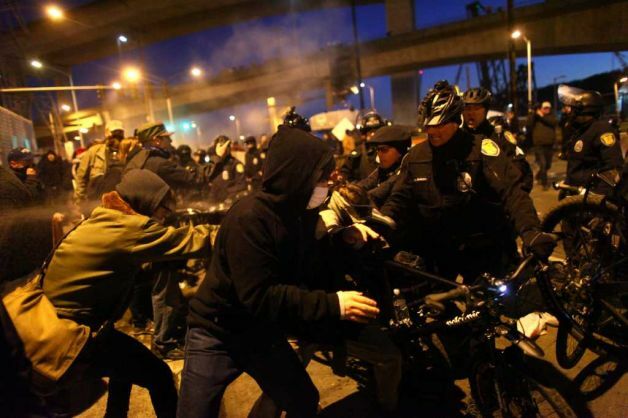 SEATTLE, Wash — Monday, December 12th, Occupy protesters and allies shut down several major ports along the West Coast. In Seattle, we stopped all evening work at Terminals 18 and 5, causing millions in profit loss to major corporations Stevedoring Services of America, American President Line, and Eagle Marine Services. Yesterday’s actions drew a wide swath of the 99%. Protesters of all ages demonstrated, and people of color turned out in large numbers. The protests included a coordinated city-wide high school walkout, a rally emceed by Hip Hop Occupies, and a three mile march to the ports. 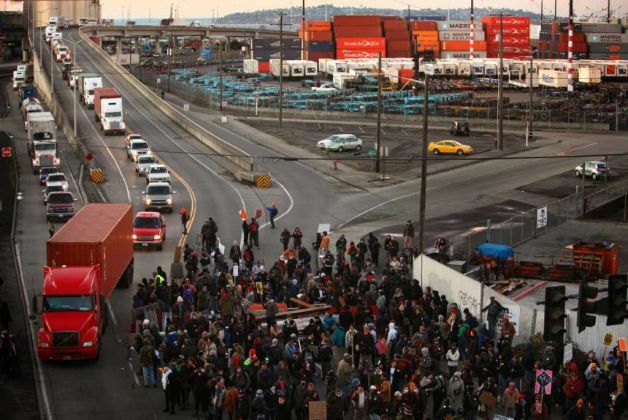 The shutdown was organized by members of Occupy Seattle in solidarity with Occupy Oakland and with the struggles of LA, Oakland, and Seattle port truckers and Longview longshore workers. Occupy Seattle’s People of Color caucus produced need-to-know guides for the action. The shutdown was solidly an Occupy action, funded by the heartfelt donations of occupiers and their supporters, and a hefty donation from Occupy Oakland. We received absolutely no material support from any union. This was a direct action in the truest sense of the term: it was rapid-fire, organized on a shoestring budget, bypassed stalling bureaucracy, and mobilized the energy of an inspired community united against economic injustice. The actions were planned with special attention to the long tradition of democracy and direct action within the ILWU. We picketed Terminals 18 and 5 in light of the longstanding ILWU principle of respecting other pickets. Union policy dictates that if arbitrators rule that picket lines are too dangerous to cross, ILWU workers will be compensated for the work they missed. The protests were wildly successful. Truck drivers and port workers repeatedly expressed support for the protesters, waving and honking as they passed. Under pressure from protesters, police backed away, but later stopped traffic once again, stating that they were trying to clear the road for police convoys to enter. In solidarity with the protesters, the truckers honked their horns loudly and persistently, and the frustrated calls of the crowd forced the cops back off the road. Occupiers then continued to direct traffic out of the port, delivering flyers of Scott Olsen’s statement to drivers as they passed (see below). At 5pm, reports came through that the union arbitrator had ruled in favor of protesters, deeming the picket too dangerous to cross. The shipping company called off work at Terminal 18 for the evening. In accordance with union contract, dispatched longshore workers were nonetheless paid for their time. Protesters then proceeded to Terminal 5, the location of the Port’s only other ship that day, chanting “Whose Ports / Our Ports.” Approximately one hundred protesters formed a human barricade and moving picket line at the terminal gate, while another hundred stood by in support. Some protesters who remained at Terminal 18 were herded onto the sidewalk. When they tried to maintain the blockade, conflict escalated. The police used pepper spray and flash grenades to disperse protesters, in one case forcibly pulling back the head of a protester to spray him in the face. A few protesters flung road flares and a bag of paint at the police in retaliation. In the resulting chaos, a number of protesters were arrested. The crowd of Terminal 18 dissipated and joined Terminal 5. After two hours of picketing, the union arbitrator once again ruled in favor of protesters, calling off work at the terminal. Many of us showed up to this action having learned from the experiences we’ve had in the short months since we began assembling together. Having previous engagements with the police, we knew to protect ourselves. Legal observers and medics were interspersed through the crowd, and the majority brought bandannas and scarves to cover their noses against flash bombs and other chemical weapons utilized by the police. Some of us sported the goggles that we learned to use after pepper spray incapacitated activists during the march on Chase Bank. Occupy Seattle’s action was one of the last in the day, following successful port shutdowns in Longview, Portland, Oakland, and other places. A hundred of our friends in Bellingham continued to break the flow of capital by protesting on the railroads, some locking themselves to the tracks in defiance. Solidarity was extended to us even from Japan, where the International Labor Solidarity Committee of Doro-Chiba made a statement of support. We send our sincere thanks to Oakland and Portland for extending their protests in response to the police aggression in Seattle that left several of our friends with stinging eyes and ringing ears. We extend our support and love to Houston and San Diego, where the police have used similarly aggressive tactics. Today, we stand in solidarity with the unemployed, the underemployed, the incarcerated, and the 89% of the working class who don’t belong to unions. We stand in solidarity with students protesting education cutbacks and rising debts, with low-wage workers protesting union-busting, with those facing foreclosure, and with the unemployed. We believe that a workers’ movement does not merely belong to the unionized, nor does it recognize imposed political borders. This is the building of a new movement. We rise from our roots in the labor movement, the civil rights movement, and anticolonial struggles across the world. Seattle began its port shutdown festivities with a rally in Westlake Park, in the center of the downtown shopping district. On one side of the park, a tableau of Christmas crap–the carousel, a carnival food vendor, the big stupid tree; on the other side, a crowd of at least 400 rabble-rousers ready to rouse some rabble. The march took the streets quickly, led by a gigantic “Rise and Decolonize” banner. The march swelled to at least 700, moving down 2nd Ave towards the port. The most popular chant was probably, “Shut down the west coast/Hit ’em where it hurts the most!” The marchers seemed pretty pumped up and excited. There were more people than expected, given that the ILWU had officially dissociated itself from the action. The other unions that have participated in previous Occupy Seattle actions were also not there. In the days leading up to the 12th, it seemed as if the Occupy movement was moving into uncharted territory, being denounced by the old, established figures in the labor movement. But the absence of these figures was a good thing—they have shown themselves to be the representatives of ideas that have grown obsolete as capitalism falls deeper into its crisis. Along the way to terminal 18, some sneaky little ne’er-do-wells paint-bombed/spray-painted a Wells Fargo and a Bank of America. The crowd was generally supportive and nobody tried to intervene. This truly was a different sort of crowd than you’d expect at a typical union demonstration. After about an hour’s walk, we finally arrived at Terminal 18. Organizers informed everyone that there was a green zone where people could hang out if they didn’t want a confrontation with the police. An unimpressive line of cops had posted up near the intersection where the demonstration intended to blockade the Terminal entrance, so a group of a few hundred moved forward. The intersection was taken with ease and soon people began to build a barricade from industrial and construction debris in the nearby lots. It was a nice-looking barricade, quite large and spanning two lanes. (Good helicopter footage of the barricade here.) There was some back-and-forth about whether or not the entire street should be blocked or only the in-going lanes. Eventually it was decided that those getting off of work should be allowed out, so some folks took it upon themselves to direct traffic out of the Terminal. The police stood around nearby. Flares blazed and smoke-bombs sent plumes of bright orange smoke into the air. After a few hours, we got word that the arbiter had decided it was unsafe for the longshoremen to cross the lines. Success! Soon after, the police moved it to kick us off the streets, bringing in their horse-slaves and shoving everyone towards the sidewalk. A scuffle ensued, people were pepper-sprayed, the cops shot some flash-bangs at us, and some things were thrown back at them. The crowd mostly dispersed but some people stuck around on the sidewalk. There were a few arrests. Meanwhile and afterwords, people began amassing at Terminal 5. A picket was going. There was news that a demonstrator had been hit by a car on the bridge between the two terminals (no word on their condition at this writing). Mostly people stood around in the street outside of the parking lot gate or walked the picket-line, chanting, chatting, or bopping around to Hip Hop Occupies’ beat-boxing. The mood was cheery after the first success of the evening, and people weren’t letting the police violence get them down. A few hours of picketing did the trick, and Terminal 5 shut down as well. Today was interesting particularly because it represented a collective step towards more confrontational tactics. It also provides a clear message to the ILWU regarding the existence of an independent and autonomous movement that has the ability to shut down the ports. The majority of the people who consistently come out to Occupy Seattle events are not connected to the Democratic Party or the traditional/old labor movement. Most of them are also youth. The rebels are coming out of the woodwork. Today was successful in meeting its limited goal. For this reason, it could be considered a training-run for future actions. These truly are only the first steps towards building an effective street presence. To future actions, bigger, bolder, and badder! Historically, the strike has been the purview of the working class, the sector of society which is both dutifully employed and overworked, hanging by the thread of the boss’s favor. The power of the strike lay in the industrial workers’ ability to stop production dead in its tracks. But we all know that the traditional blue collar job is a rarity these days and that the US economy has lost much of its industrial production to the whims of global capitalism. Now the working class exists most predominately as the underbelly of its former self, as the excluded class—the unemployed, underemployed, illegally employed. It no longer holds the same power as it once did to shut down the economy from the workplace. Some of our potential comrades still work in the old world of production: longshoremen, port truck workers, and others. The rest of us exist outside of that world, and indeed, some of us always have. Our workplace has become the place of precarity—we occupy the streets because we have no workplace to occupy. We are the face of the crisis of capitalism. When we blockade the ports and staunch the flow of capital, we do it from the outside, as displaced people, no longer as workers but as those excluded from this system, as those who have no hope in the economy, no hope in capitalism. When we shut down the port, we dream of the day we shut down the entire system with its jobs and its economy of suffering.